Editors Note: There are two maps associated with this release. The 2015 Coosa Graphite Project drilling program results successfully upgraded a significant portion of the previously released initial mineral resource estimate (announced on September 3, 2013 and filed on SEDAR at www.sedar.com) (the "Initial Mineral Resource Estimate") from the Inferred to the Indicated resource categories and sizably increased the Inferred resource category. These results, in conjunction with the results from the Company's pilot plant, currently underway at SGS Mineral Services in Lakefield Ontario (see September 15, 2015 news release), will provide the foundation for the Company's Preliminary Economic Assessment ("PEA"), currently being prepared by AGP Mining Consultants Inc. (announced July 27, 2015) and scheduled for completion in Q4 2015. This Updated Mineral Resource Estimate replaces the Company's Initial Mineral Resource Estimate which consisted of 38,159,000 tons in the Indicated Resource category grading 2.60% Cg, and 26,992,000 tons in the Inferred Resource category grading 2.87% Cg, utilizing a 2% cutoff grade, as opposed to a 1% cutoff grade utilized for the Updated Mineral Resource Estimate. *Mineral Resources that are not Mineral Reserves do not have demonstrated economic viability. There is no guarantee that all or any part of the Mineral Resource will be converted into a Mineral Reserve. *Inferred Mineral Resources represent material that is considered too speculative to be included in economic evaluations. Additional trenching and/or drilling will be required to convert Inferred Mineral Resources to Measured or Indicated Mineral Resources. Mineral Resources that are not Mineral Reserves do not have demonstrated economic viability. There is no guarantee that all or any part of the Mineral Resource will be converted into a Mineral Reserve. In the Company's Initial Mineral Resource Estimate, based on the results of a 69-hole, 20,239.4-foot drill program, the selling price for primary processed, run-of-mine production was assumed to be USD$1,450 per ton of graphite. Mining, milling and processing costs were estimated at USD$2.00 per ton for mining and USD$10.00 per ton for processing, based on publicly available graphite mining costs. Graphite recoveries for primary processed, run-of-mine production were assumed to be 90% for primary processed graphite product. The difference in graphite selling price per ton and graphite recoveries between the Initial Mineral Resource Estimate and the Updated Mineral Resource Estimate reflects management's strategic intent - pending publication of a positive PEA - of exclusively targeting the oxide portion of the Coosa Graphite Project's mineral resource and, subsequently, to divert all graphite production to secondary-processed, specialty high-purity graphite (see September 29, 2015 news release, regarding the Company's preliminary graphite purification trials at one of North America's premier - and completely independent of the Company - metallurgical laboratories), which will be outlined in the forthcoming PEA. Donald Baxter, P.Eng., Co-Chief Executive Officer of Alabama Graphite Corp. commented, "The release of our updated, independent Mineral Resource Estimate for the Coosa Graphite Project represents a major milestone for Alabama Graphite and its shareholders. We are very pleased with the results. Our rapid progress at Coosa can be attributed to the project's demonstrated ease of extraction of our oxide material, an at-surface deposit and simple geology. Combined, these factors have allowed us to significantly increase the Indicated and Inferred Resources as a result of our 2015 expanded drilling program. "This updated Mineral Resource Estimate, coupled with the results from our 200-ton pilot plant, will provide us with a solid foundation to develop AGC's Preliminary Economic Assessment, scheduled to be released later this year. The PEA will be based on a strategy not to sell conventional, run-of-mine graphite, but to further process the run-of-mine graphite into a secondary, specialty graphite - in particular, coated spherical graphite (or 'CSPG') for use in Lithium-ion batteries," said Mr. Baxter. "I believe our successfully updated Mineral Resource Estimate further demonstrates the importance of having a knowledgeable and highly experienced graphite mining team when attempting to advance a graphite project. Because the AGC team embodies those traits, we have been able to accelerate our progress effectively to complete this latest milestone. The update has further increased our knowledge and confidence in the Coosa mineral deposit, which will be very helpful in identifying further optimization opportunities as we develop the PEA for the project," stated Ron Roda, President and Co-Chief Executive Officer of Alabama Graphite Corp. "We look forward to the release of the PEA, pilot plant results and reporting further on specialty graphite developments." Mineral resources were estimated in conformance with the CIM Mineral Resource definitions referred to in National Instrument 43-101 Standards of Disclosure for Mineral Projects. An independent technical report that supports the Updated Mineral Resource Estimate will be filed by the Company on SEDAR (www.sedar.com) within 45 days of publication of this news release. 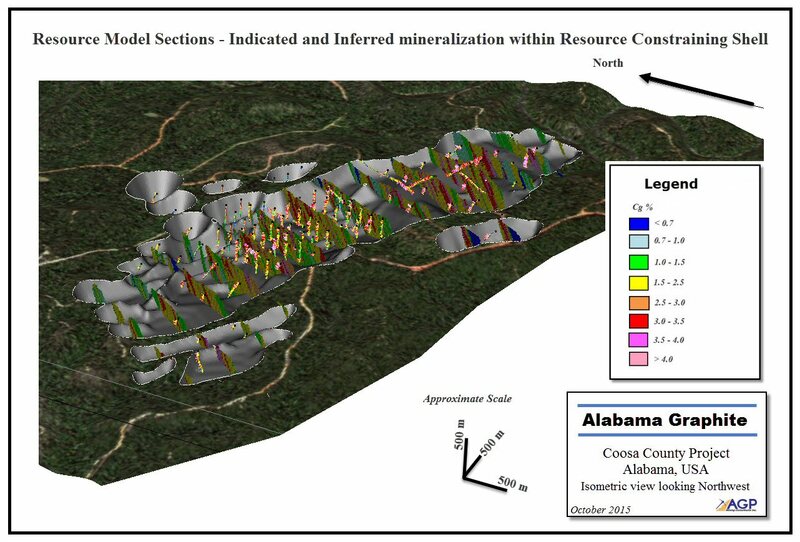 Alabama Graphite Corp. remains on schedule to publish the Coosa Graphite Project's PEA in Q4 2015 (see July 27, 2015 announcement) incorporating the Company's drill results from 2012 to summer 2015. Scott E. Wilson, C.P.G., President of Metal Mining Consultants Inc., a Qualified Person as defined by National Instrument 43-101 guidelines and an independent consultant to the Company, has reviewed and approved of the contents of this press release. Alabama Graphite Corp. is a Canadian-based flake graphite exploration and development company. The Company operates through its wholly owned subsidiary, Alabama Graphite Company Inc. (a company registered in the state of Alabama). With the most advanced flake graphite project in the contiguous United States of America, Alabama Graphite Corp.'s objective is to become the first producing American graphite mine this century. A highly experienced team leads the Company with more than a 100 years of combined graphite mining, graphite processing, specialty graphite products and applications, and graphite sales experience. Alabama Graphite Corp. is focused on the exploration and development of its flagship Coosa Graphite Project in Coosa County, Alabama, and its Bama Mine Project in Chilton County, Alabama. The Coosa Graphite Project hosts an NI 43-101 Indicated Mineral Resource Estimate of 78.5 million tons grading 2.39% graphitic carbon (Cg) - the largest Indicated Mineral Resource of flake graphite in the United States. Please refer to the Company's technical report titled "Technical Report - Alabama Graphite Corp. - Coosa Project" dated September 5, 2013 prepared by Scott E. Wilson, C.P.G. and Stewart D. Redwood, F.I.M.M.M. and filed on SEDAR at www.sedar.com. Alabama Graphite Corp. holds a 100% interest in the mineral rights for these two U.S.-based graphite projects, which are both located on private land. The two projects encompass more than 43,000 acres and are located in a geopolitically stable, mining-friendly jurisdiction with significant historical production of crystalline flake graphite in the flake graphite belt of central Alabama, also known as the Alabama Graphite Belt (source: U.S. Bureau of Mines). A significant portion of the Alabama deposits are characterized by graphite-bearing material that is oxidized and has been weathered into extremely soft rock. Both U.S. projects have infrastructure in place, are within close proximity to major highways, rail, power and water, and are approximately three hours (by truck or train) to the Port of Mobile, the Alabama Port Authority's deep-seawater port and the ninth largest port by tonnage in the United States (source: U.S. Army Corps of Engineers/USACE). The state of Alabama's hospitable climate allows for year-round mining operations and the world's largest marble quarry (which operates 24 hours a day, 365 days a year in Sylacauga, Alabama), is located within a 30-minute drive of the Coosa Graphite Project. For further information and updates on the Company, please visit www.alabamagraphite.com or follow us on Twitter (@AlabamaGraphite) and Facebook (/Alabama.Graphite). By their nature, forward-looking statements involve known and unknown risks, uncertainties and other factors which may cause our actual results, performance or achievements, or other future events, to be materially different from any future results, performance or achievements expressed or implied by such forward-looking statements. Such factors include, among other things, the interpretation and actual results of current exploration activities; changes in project parameters as plans continue to be refined; future prices of graphite; possible variations in grade or recovery rates; failure of equipment or processes to operate as anticipated; the failure of contracted parties to perform; labor disputes and other risks of the mining industry; delays in obtaining governmental approvals or financing or in the completion of exploration, as well as those factors disclosed in the Company's publicly filed documents. Forward-looking statements are also based on a number of assumptions, including that contracted parties provide goods and/or services on the agreed timeframes, that equipment necessary for exploration is available as scheduled and does not incur unforeseen breakdowns, that no labor shortages or delays are incurred, that plant and equipment function as specified, that no unusual geological or technical problems occur, and that laboratory and other related services are available and perform as contracted. 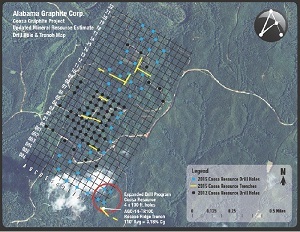 The Alabama Graphite Corp. Coosa Graphite Project Updated Mineral Resource Estimate Drill Hole and Trench Map. The Alabama Graphite Corp. Coosa Graphite Project Isometric Resource Model Sections -- Indicated and Inferred Mineralization within Resource Constraining Shell.